People have been asking me when Effective Modern C++ will be done. (My wife is among them, and our dog has been giving me funny looks, too.) For my earlier books, the "when will you be done" question was easy to answer, because my deliverable was camera-ready PDF. A book was done when I sent in the final PDF. Done, Stage 1, is when I send in a "final" manuscript for typesetting. Done, Stage 2, is when I submit information to be used for preparing the index. Done, Stage 3, is when I approve the typeset versions of the book. The final stage of doneness is when I approve the index. At that point, the book is ready for publication. We're currently in the middle of Stage 3. O'Reilly send me their initial cut of PDF and digital files (i.e., epub and Kindle-compatible mobi) for the manuscript I submitted at Stage 1. The process of my revising these files is known as QC1. I've sent back my QC1 comments, and I expect to get QC2 files in a few days. QC1 didn't include the index, but the QC1 index is supposed to show up in my inbox any time now. In the meantime, work on the book's cover is moving along, and above you can see what I expect to be the final front cover image. We're also honing in on the text to go on the back of the book. O'Reilly's marketing department and I have gone through four iterations so far. It's not easy to describe in ~250 words what a ~300-page technical book is about and why you absolutely positively must buy it, but we're doing our best :-). I continue to expect the book to be available in October. I'll keep you posted on the book's progress. Nobody wants this book to be fully done more than I do, but it's important that it be not just done, but done well. The final two stages of doneness will help ensure that that's the case. When it comes out, it will be the first book I've written that was designed to render well on both paper and digital devices. If you consume it digitally, it should look as good (and be as useful) regardless of whether you prefer portrait or landscape, color or monochome, and large or small fonts. The only formatting assumption I make is that I can fit 64 monospaced characters on a line, so some code examples could get a bit whacked out on small cell phones, but other than that, my goal is that EMC++ should look good and convey useful information no matter how you read it. 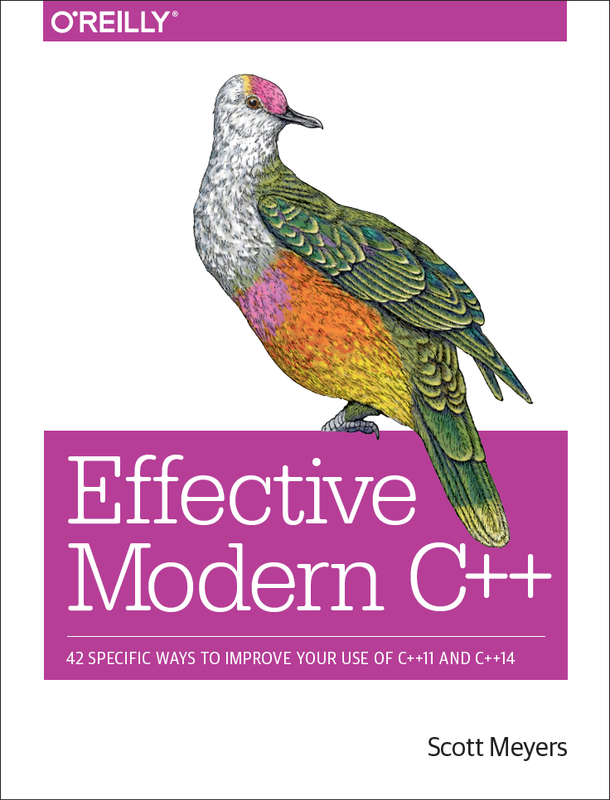 I just had a nice family vacation and, in addition to eating a lot of good food, I devoured the first 39 items in Effective Modern C++ from the O'Reilly early release PDF. Scott, your writing is superb as always. Few technical books combine both clear and concise descriptions of complex things and do it in a way that's fun and readable. I had quite a few "aha!" moments when reading and feel like I'm starting to understand C++11 and C++14 with enough capability to actually use the features (correctly). Is the latest Early Release of the pdf the same content as the final draft you submitted in Done Stage 1? Looking forward to Done Done! @Anonymous: Thanks for your kind words. I'm glad you found the pre-release version of the book useful. @Kylo G: The latest Early Release book is dated August 17, but Done Stage 1 was submitted on August 31, so the versions are not identical. I was making changes to both the technical content and the wording up until the last minute (and continued to do so in QC1), so when the final version comes out, you'll notice some changes. The current Early Release version is probably at least 90% the same as what will get published, but in the delta are some important technical refinements as well as some improved examples. Plus, of course, some fixes to little things like incorrect font usage and spelling errors. Thank you Scott for your attention to detail. I already have bought too many thousands of paper books in the past, these days almost all my purchases (old and new) are digital as I'm thoroughly tired of lugging all those atoms around. It's been a pleasure to ditch them. Far too many technically-oriented books seem to just 'tack-on' ebook formatting seemingly as an afterthought. It shows real professionalism on your part to pay close attention to this. I look forward purchasing this book in October! Scott, if I buy an hardcopy...will I be entitled to download the soft copy also. As my hardcopy will outdated as and when you update the contents. @Ramnarayan Gupta: From what I can tell, O'Reilly's policy is to offer the digital book for 10% more than the cost of the print book if you order them together. So if you buy a hardcopy, you'll probably be "entitled" to download the soft copy for 10% more. Unfortunately, the bundled pricing doesn't seem to exist until the print book is in stock. When the book gets updated after its initial publication, the updates will be made available to owners of digital versions of the book. Owners of hardcopy books will have to be satisfied with the errata list, which I'll publish online for EMC++ (as I do for all my books). @BM: O'Reilly and I had a phone call on Friday, during which it became clear that we'd have to slip the production schedule. None of us are happy about it, but we're all committed to releasing a top-qualify book, and living up to that commitment is taking longer than was originally forecast. Given that the production team and I are working together for the first time, such a delay, while disappointing, is not terribly surprising. We're pedaling as fast as we can, I promise. Cheers Scott. disappointment at delays is obviously a sign of great excitement over the book. Hopefully it'll be a bump free ride from now until Nov.